Note: This is a reprint of my review for Room, which originally ran on September 15, 2015 after seeing it at the Toronto Film Festival. I am publishing it again today as it hits theaters this weekend. Alice in Wonderland has been used as inspiration for what are surely an innumerable number of stories. The idea of getting lost down a rabbit hole or your life not going the way you'd imagined it when you were a child is universal. 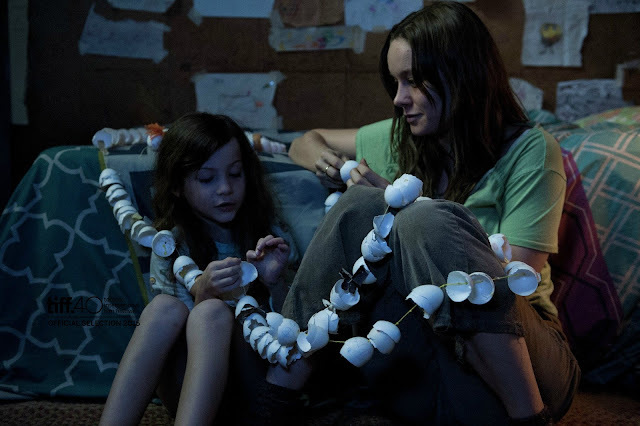 The metaphors and analogies to be made are no doubt endless with any aspect of any single person's life, but Room is a certain kind of Alice story as you can feel the loss of our protagonist both physically and psychologically. Loss is a key word, a key theme if you will given the circumstances of the situation presented in the film, but if you don't know that situation going in you're all the better for it. All that is necessary to know is that Brie Larson plays Joy Newsome, a woman who has seemingly been trapped in a single room shack for an ungodly amount of time while having raised her five year old son, Jack (Jacob Tremblay), in this confinement for the entirety of his life. There is only a single door in their room and it is protected by a locking system that only a mysterious visitor (Sean Bridgers) knows the code to. This stranger, referred to as "Old Nick", brings Joy and Jack food once a week, but like the majority of the supporting characters in any Alice story, he is cruel towards our heroine. 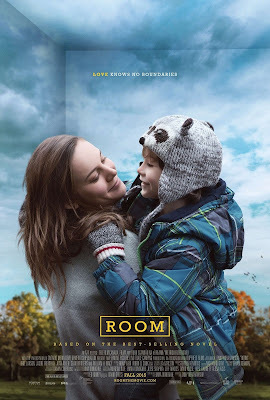 Knowing little more than this myself before walking in, Room operates as a tense and unnerving thriller for it's first half before becoming an intense psychological trip in it's second. Both are equally engaging as is the film as a whole. Jack (Jacob Tremblay) learns a distorted view of the outside world from mother, Joy (Brie Larson). Director Lenny Abrahamson (Frank) begins his adaptation of Emma Donoghue's best-selling novel (who also penned the screenplay) by giving us a glimpse of the daily routine for Joy and Jack. It is Jack's fifth birthday and the first time he and his mother will bake a real birthday cake together. When Jack wakes in the morning he says hello to every item that is contained in their small, square world. He is affectionate towards a dresser he must sleep in when "Old Nick" comes to visit, he has names for his spoon and a special place in his heart for his TV. In order for Jack to understand why they can't leave this shelter Joy has made up numerous stories to convince him it is for their own safety. Jack believes the world is a disaster, a post-apocalyptic wasteland of sorts and that there are aliens beyond their walls with everything he sees on TV being a work of fiction. This kind of twisted mentality obviously gives Jack a warped view of the world and only breaks Joy's heart further as she continues to raise her son day after day, with zero room to breathe on her own. One can only imagine how this leaves her state of mind all the worse for wear as well. It is best not to watch the trailer for Room as certain plot points are given away so I'll stop there before I tempt you too much, but if you've read Donoghue's novel or have already seen the trailer you know that the story only goes on to explore the repercussions of this kind of nurturing and the adverse effects it has on Jack. Again, without going into too much detail what Room really enjoys mining is the psychology of the traumatized mind. With both Joy and Jack we enter into two extremely different sets of emotional trauma. In dealing with the experience of being confined to a single space for a number of years on Joy's end and with Jack knowing nothing else of the world other than "room", as he affectionately refers to it. As far as Joy is concerned she begins to question herself and her choices. Was it best to even raise a child under such conditions? Was she being selfish in keeping Jack with her? Is Jack better off without her? These all come flooding in at a time when Joy should indeed feel the emotion her name inspires, but instead she can't shake the idea that she has scarred her child forever. Maybe even moreso than anything "room" inflicted upon him. Throughout all of the highs and lows that Joy and Jack come to encounter it is Larson's consistent fragility that makes us unsure of what might be around the corner. It can't be easy for what seems like would be a typically strong woman to submit to such restrictions, but Joy clearly does this to protect her son. As she is the only one for the first half hour or so that knows the whole truth of the situation Larson plays the role with as much effortless care as one would likely expect. Larson displayed a knack for compassion and empathy in 2013's Short Term 12 and she again utilizes that ability here in order to make us feel the dire circumstances she has suffered. When it comes down to it, Room is really the story of the love between a mother and her child and without Lasron's vulnerable yet synonymously bold turn the film wouldn't resonate nearly as much. Jack has only known "room" his entire life, but is that about to change? As good as Larson is though, Tremblay is equally as impressive. It is almost impossible to even conceive of how to visually show what it must be like to experience the world for the first time and even harder to find a child actor who could hope to convey that mentality, but with Donoghue's keenly observational dialogue and Tremblay's innocent voice and wandering eyes Abrahamson somehow manages to pull it off convincingly. Tremblay is especially effective in scenes where he interacts with Joan Allen and Tom McAmus. Without giving away the context of these scenes, trust that they are some of the most affecting in a work that provides one of the most heart-pounding and tense sequences I've seen in a film for some time. This sequence also hinges solely on the performance of Tremblay and the physical performance he delivers. It is something we don't consciously consider when watching the film, but every bit of what we see Tremblay do on screen in this scene matters and builds it to an exceptional moment in a rather outstanding film. The film hinges on these two performances, this mother and son relationship and both Larson and Tremblay dig deep to deliver an idea of what it might really be like in situation similar to those news stories we tend to find so fascinating. In the first half of the film, once we realize the circumstances of our characters, we begin to root for them as opposed to simply being fascinated by their situation. When the second half of the film begins we then dig into that process of exploring the damage that has been done. That is all to say, the film keeps up the tension and mystery enough in the first half to make this exploration of the second all the more worth finding interest in. Sure, the score is a little intrusive at times, telling us how we should feel and the last scene more or less feels tacked on so that Abrahamson can end on a specific shot, but overall Room is one of the better films I've seen this year. 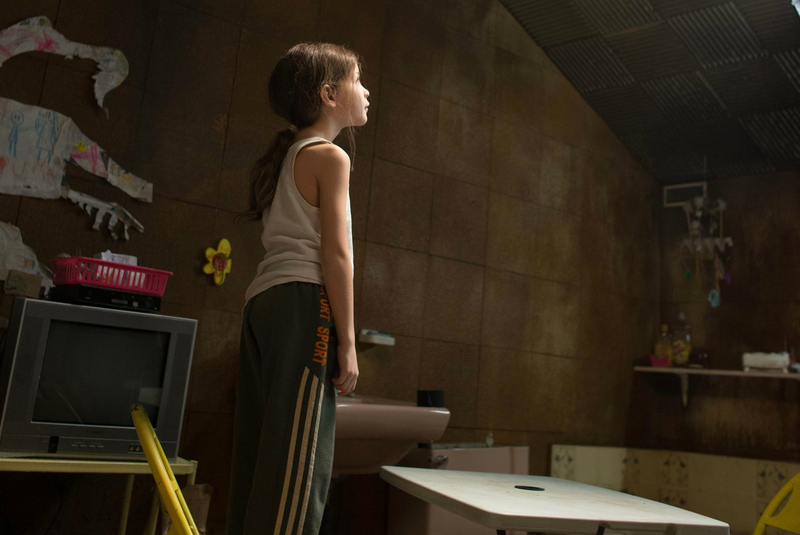 And like Alice, both Joy and Jack seem to relegate their experience in "room" to something of a nightmare. Not necessarily something that lends itself well to finding a resolution and while nothing good or worthwhile comes from this type of solitude our characters are able to come to some kind of piece with their existence, to be able to begin dreaming again instead of constantly living a nightmare.